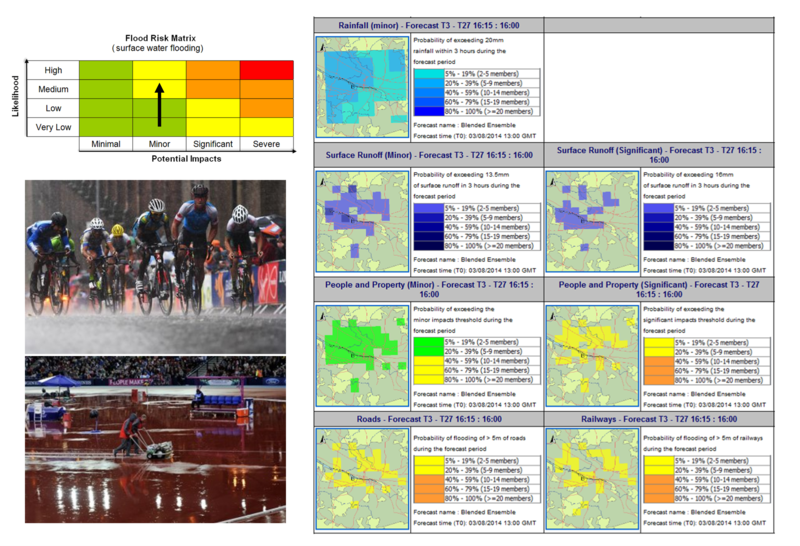 We are pleased to report that the Glasgow surface water flood forecasting model ran successfully during the Commonwealth Games and throughout the summer. Luckily the weather during the Games was largely fine however there were occasions when the additional surface water guidance provided a real benefit to organisers and responders. This took two forms, firstly enabling the SFFS to advise that although heavy rainfall was forecast in the wider West Central Scotland region and we had flood alerts in place, flooding impacts in Glasgow itself were unlikely. Secondly, as was the case on the last weekend of the Games shown below, to provide information on the timing, likely impacts and probability of possible flooding in Glasgow. The project has provided a unique example of operational surface water flood forecasting and has generated interest from other operational centres and researchers in the UK and abroad. An overview of the project has been published today on the Hydrological Ensemble Prediction EXperiment (HEPEX) website and on the NERC Flooding from Intense Rainfall project blog. There will be a final meeting with members of the steering group later in October to discuss how we can take forward the lessons learnt from this project to help develop our surface water flood forecasting capabilities across Scotland in the future.